With the recent announcement of Salt Lake Comic Con’s FanXperience January 29-31, I decided I wanted to challenge myself; and YOU are all going to be by my side through the process. 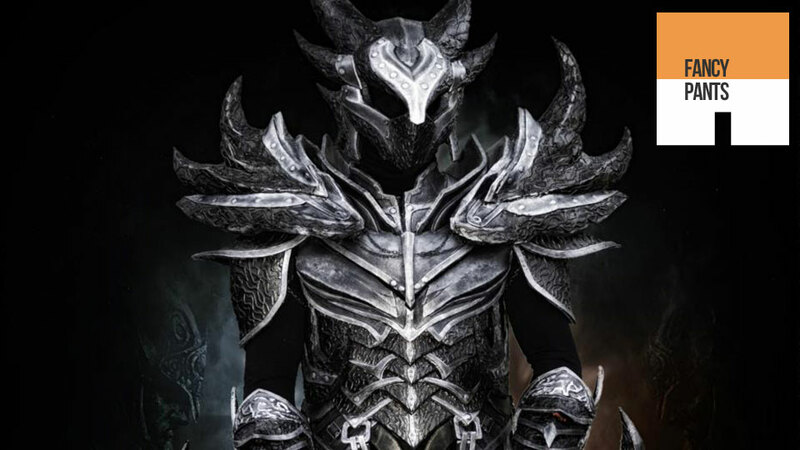 I am building a beautiful set of Daedric Armor. No, I’m not kidding and yes, I may be slightly looney. The Daedric Armor I’m constructing is based off of The Elder Scrolls V: Skyrim. I happened to get my hands on the original artwork concepts for The Elder Scrolls and I came across the set and I fell in love. I knew I had to make it almost immediately. I also knew that this specific project would test every piece of knowledge that I have picked up during my cosplay career. This will be a seven part online tutorial of how I constructed my set. I hope you enjoy it!! Are you ready? Don’t worry, we’ll take this slow. Please, if you have any questions at any time during my online tutorial, don’t hesitate for a moment to ask! 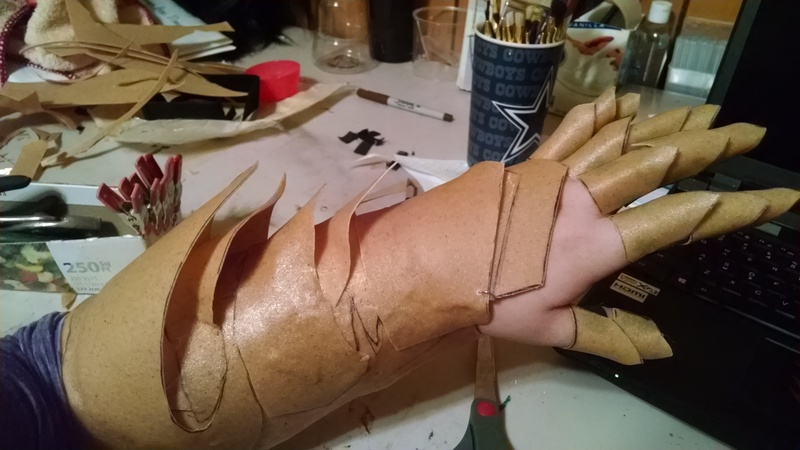 Bracers- Daedric bracers are by far the most intricate pieces on a costume that I have ever constructed. They compile a multitude of different patterns, colors and let’s not forget- spikes! The traditional colors of a Daedric contain Black, Silver, and Reds. I’m a rebel (alliance) and decided to give the set a new twist and I’m replacing the color Red with a deep Purple. 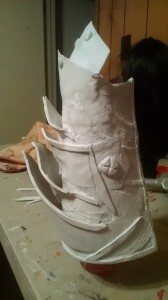 I began the build with a basic bracer pattern. This pattern is very similar to the one by the amazing Kamui Cosplay. The only difference was I based mine off of a rounded elbow tip instead of a pointed one. 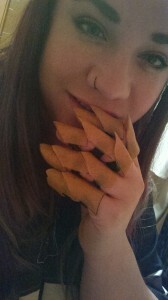 I made this bracer from a German material called Worbla. I started with this and left space between the connecting of the pieces on the bottom of my arm. 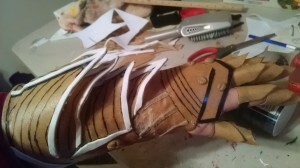 Later, I will attach elastic pieces connecting the bridge pieces to tighten the bracer to my pleasing. As I get to this point I will show examples. 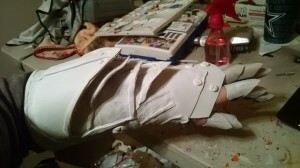 Once I had the basic bracer complete, I added detail to the surface. 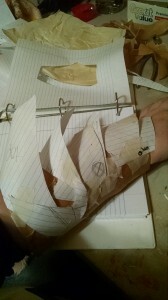 To plan this out, I used lined pieces of paper and I drew out what I wanted each layer to look like and taped it to the bracer. This gives you an opportunity to plan out how you want your bracer to look before you start playing with expensive materials. I then started on my fingers! I made small house shaped patters that fit all of my finder joints when they were curved into rings. 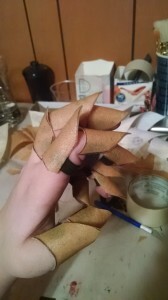 I then attached pieces of elastic around the bottom bridges and created sort of claw rings. Together, I have fourteen rings. When I had the separate patterns for the bracer layers, I flattened the patterns onto Worbla, traced and cut. This part is where your opinion and wants come into play. How pointy do you want the layers? How far do you want them to stick out? These are all questions you should wonder before heating and applying the goey cookie dough like material. I chose mine to be fairly level with the bracer so that I don’t get it snagged on passing objects. The next steps were detail work. First I drew out where I wanted to place details. I added then added things like rivets (made of Worbla), trim (from Foamies), and I Dremeled out all unwanted layering. Once I was happy with the amount of detail placed into the piece, it was time to sand. Now, sanding I believe is absolutely your choice. This is a rough, rigid looking costume. I sanded because I think it makes it easier for the primer to lay. It just needs to be sanded enough to have a rough texture. (I used a 320 grit Dremel piece). Now you prime! 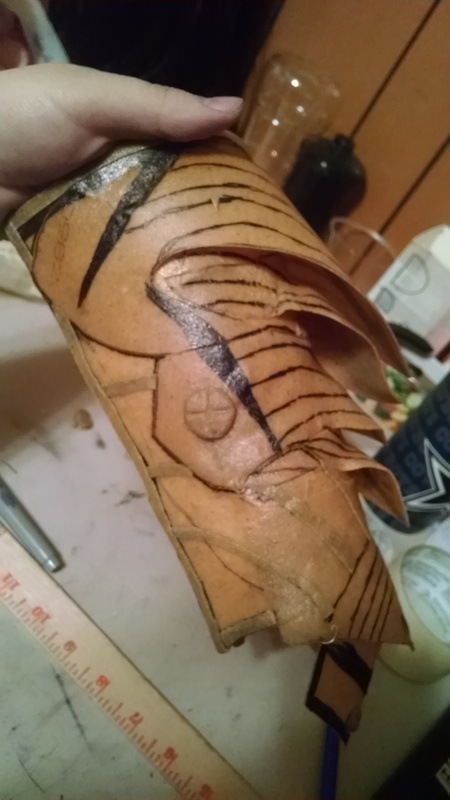 I used two different methods on the bracer so that I may show you guys both techniques. The primers that I used were Gesso and Wood Glue. Out of the two I prefer to use wood glue. Gesso requires sanding after application of layers. The wood glue does not. If you’ve never used Gesso before, you can find it at your local art store or grocers like Walmart. It is a white, chalky smooth goo that is used to prime canvas boards before painters, paint. 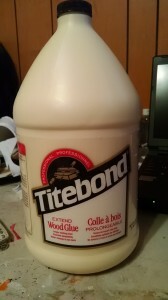 Wood glue, is well… Glue for wood. My biggest tip before applying any primers is to remove any sanding dust from the piece. Whether you use a chip brush, air or your fingers- get that stuff off the best you can. It will make your priming experience much easier. I wish I had taken more pictures of this painting process, (I will with other pieces) but, I get so excited when it’s time to paint because it is my favorite part. So, I will explain the processes as best I can. When your primer is completely dry, take a color pallet (find one at a local grocer) and fill it will your base color (a color used to show contrast between deep divits of the piece, and upper edges) mine was black. You’re accent color, mine in this case in the Purple, and your top main color, mine was a metallic silver. Start coloring your piece with your base color making sure you cover all areas of the piece that is going to be covered by your main color. I used the black as the bottom layer, and I layered it on top with my silver metallic. After the black, I went in a painted the trim and detail rivets of the bracer. The color I used was not highly pigmented, (Which if applicable, I HIGHLY recommend) so I had to cover it with two coats. 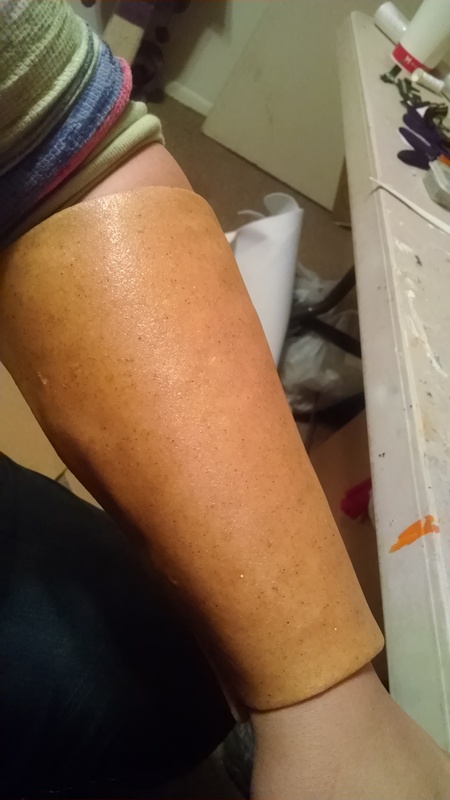 When I was finished with the details I wanted to be colored purple, I went in with my metallic silver and I covered all of the areas that were Black. PLEASE MAKE SURE YOUR BLACK OR BASE COLOR IS COMPLETELY DRY BEFORE YOU PREFORM THIS STEP. It will mix and smear your base and main if the base color is not dry when you go to apply your main. Let everything dry for a good long time. After everything was dried and pretty, I took the piece outside and I sprayed it with a light layer of clear coat spray paint. I like to use a UVA UVB protectant top coat because I tend to do a lot of shoots outdoors. This will help keep your colors bright and vibrant from the sun’s dulling rays. And you’re finished!! 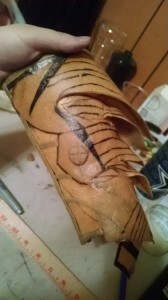 This was my ending result Bracer. The total work time of this bracer took about 8 hours from start to finish with the majority of the time being dry time. Hooray! 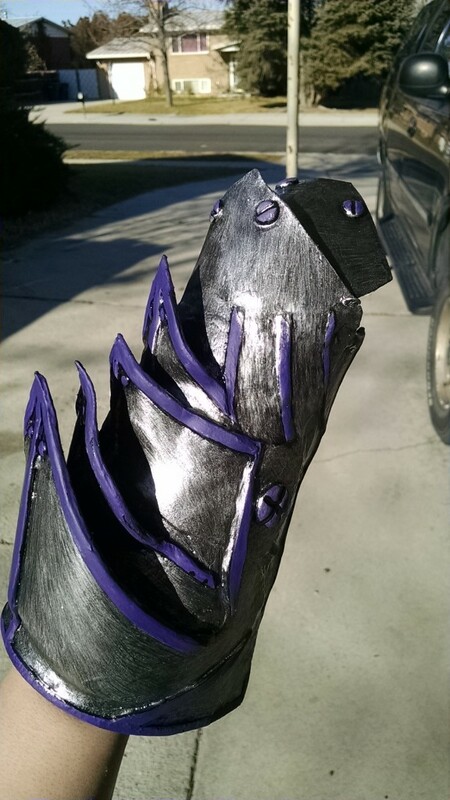 You made a Daedric bracer. I hope this tutorial helped! As I said before, if you are having a difficult time or need a little extra help, contact me! Comment below or contact me through my Facebook page! Thank you for reading! I love you all, my Geekery army, you! Ash Sweetring started cosplaying in 2013 after learning that there was an entire culture of people that were accepting of nerdlings who costumed for fun. Her first cosplay was a group build of a Dranei from the WOW series. While not for herself, the costume turned out great and Ash was hooked. From there she started creating her own cosplays such as Ash Ketchum, Zatanna and her recent baby, Samus Aran. Other than cosplay, She’s an all-around artist. 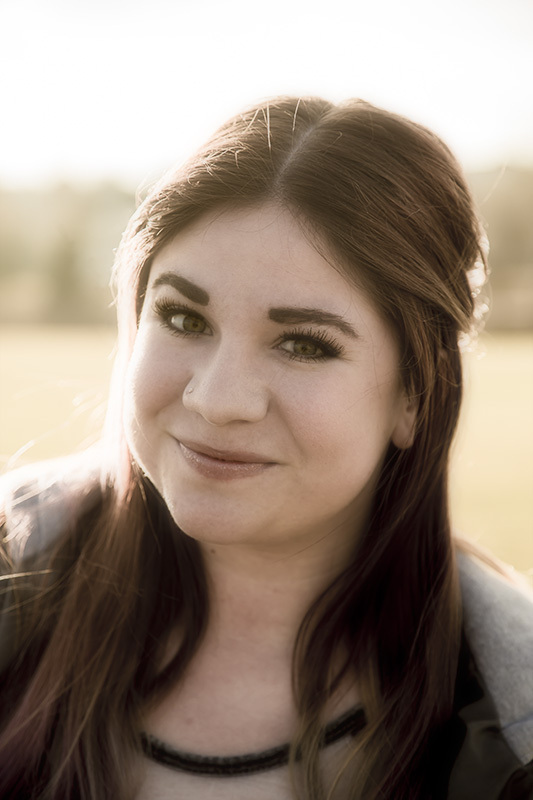 She can draw, color, and she’s attending the University of Utah for Game Development. That’s right, one day, she’ll be designing all of your favorite gaming characters. You can find more of her work here on ComicCon.tips, soon in our YouTube channel or you can find out more about Ash on her official Facebook page.